Download this week’s bulletin here. Grace and peace to you from God the Father and from our Lord and Saviour Jesus Christ! Today we read about Jesus sending his disciples with a message about His kingdom. This sending was almost as a preparation for the sending of the disciples to all nations. We also are sent with the same message, we also are sent by the same Lord. That’s why it is so important to reflect at what this passage reveals us about our mission. This passage is very rich and we can’t discuss all that it contains that’s why we’ll focus on three things. On message itself, what is its content, on authority, that is, on behalf of whom we are speaking, and on our motivation, why should we be motivated to bring this message to all people. First of all, about the message. Sending out His disciples Jesus instructed them what are they supposed to speak. We can clearly highlight two things. Go and say: ‘Peace be to you’, and ‘the kingdom of God has come near to you’. When we read these words in English we lose the profound beauty and depths of what was being said. When we think about the word ‘peace’, we usually understand it as an absence of war, absence of arguments. This is far from what is meant by the word ‘peace’ in the Bible. We are talking here about the Hebrew word ‘shalom’. It was the word used to describe the total, all embracing well-being. Physical wellbeing, emotional wellbeing, social and spiritual prosperity. Not just for individuals, but for entire community. That was the word to describe what would life look like in God’s presence. Shalom. Peace. This was the state of being which was lost after the Fall and for which all the faithful were longing. Already in Moses time, God Yahweh commanded His chosen nation, Israel, to bless one another by invoking God’s shalom. When said, these blessings were efficient bringing God’s shalom to one’s neighbors. Not in some magical way, but because of God’s command and promise attached to them. God presence was implied, faith in true God was implied. God’s blessings could come only when you had relations with God. Just think about it, for three and half millennia we have blessed one another with these words. ‘The Lord bless you and keep you!’ How many generations of faithful have heard them?! We are in the same Church with all of them. Does it ring a bell? When Jesus begun His ministry He proclaimed that “The time is fulfilled, and the kingdom of God is at hand; repent and believe in the gospel.” (Mar 1:15 ) And now He was sending out His disciples with the same message, go and tell that the Kingdom of God is near. The presence of the Kingdom of God was the reason why Jesus disciples were sent to proclaim God shalom. Jesus Christ, the Son of God, and prince of shalom, as prophet Isaiah calls Him (Is 9:6), was in their midst. By His presence Jesus brought the long awaited restoration of the entire creation. He brought healing to this world – physical and spiritual, healing our bodies and forgiving our sins, cleansing our consciences and restoring our relations with God the Father and with one another. He brought shalom. We are not sent to proclaim something that is going to happen. We are sent to proclaim what has already happen. That’s our reality. We are just waiting for our King’s glorious return, when all the nations will be gathered before His throne. (Mt 25:31-32) That’s our message. Beautiful and powerful. Now, let’s talk about the authority. We discussed in “Unmasking Christianity” Bible study that there is an inscription from the time of Jesus that begins with words “The Gospel of Caesar Augustus”. What’s that? At Jesus times the word ‘gospel’ was used speaking about significant events. About a victory in a war, or about the ascension on the throne of a new king. These were news that everyone should know. Because everyone was influenced by them. The gospel of Caesar Augustus meant that he had begun His reign. He was the new emperor of the Roman Empire. We know that the Gospel according Mark begins with the words: “The beginning of the gospel of Jesus Christ, the Son of God.” (Mar 1:1) What does it mean? That Jesus, the Son of God has begun His reign. His kingdom is established as God promised it. He have got all authority. We know that society in which we live is becoming more and more hostile to the Gospel. Western culture is becoming more and more religious, just in a different sense. More and more people have begun to believe, yes!, believe, not to know, this so called secular, materialistic worldview, which claims to be scientific. It only claims, but essentially it is just one more religion, where instead of God, they have evolution and we can be like gods ourselves. Don’t be deceived! This worldview is not neutral, it is not tolerant, it is aggressive against anyone who doesn’t agree with it. That’s why there are statements like: “Keep your religion private, that’s your personal thing.” On the other hand, we’ll promote our secular religion by all means – in education, in politics, in media, everywhere… But you, other, keep silent! We need to turn it around and put things straight. At least in our minds. We need to see things as they are otherwise we don’t even know from whom we need to protect our faith. Religions, on the other hand are not real. It is when you make up your own ideas about this world, with God or without God, about us, about how to live in this world, and then believe and try to follow them contrary to what your senses, reason and experience tell you. There really is no big difference which religion to believe, secular, evolutionary materialism, Buddhism, Islam or some other. That’s a private choice. And I would agree that if you have a religion, keep it private. Don’t try to impose it to others. Don’t try to teach in schools and promote in public media. But this is exactly what is happening today in Western culture. Secular worldview is being imposed to everyone as the only objective reality, which it is not! When Jesus sent His disciples and when He sends us, it is not about religion. It is not about self designed ideas or theories about this world. It is about reality. This is the Gospel of the Lord. His Kingdom has been established. All authority has been given to Him. That’s it. You may like it or not. You may want to accept it or not. When Caesar Augustus sent around His gospel, it was not matter of preference. If people didn’t like it, so what? He was emperor. They had to live with it. Of course, they could decide to resist His reign, become rebels. This way they would openly make themselves his enemies. That’s an option. When we are sent to bring the Gospel of Jesus, this wonderful Gospel that gracious and merciful God has begun His reign, that He has all authority, even over death, we are not talking about our personal preferences. We are speaking with Jesus authority, and on behalf of Him. This we need to keep in mind when we proclaim His Gospel. We are just messengers. The authority of this message belongs to Christ. Our message is beautiful. This is the message about the restoration of this broken world, the message about shalom that is given to us as a gift. It cost a whole lot to God, but we get it for free. As Jesus said, if people don’t accept it, leave them, but remind that the Kingdom of God is here. Our responsibility is to share this message. The one who listens us, listens Jesus. The one who rejects us, rejects Jesus and rejects also God the Father who sent Him. When someone rejects the Gospel, they rebel, they revolt against the true Lord. That’s a consequence. On one hand, it puts huge responsibility on us. We are God’s messengers, we need to do our best to deliver the message as clearly as possible. There is no excuse to us if we don’t study the word of God and don’t try to learn how to bring it to people around us in a best possible way. This has to be our priority. On the other hand, Jesus words give us a great comfort. We are just messengers. We are not speaking on our behalf, but with Jesus authority. We are not selling ourselves. We are not selling some kind of religious principles. No, we come bringing God’s shalom to everyone. If the message is welcomed, this is Jesus and the kingdom of God that are welcomed. If the message is rejected, this is Jesus who is rejected, and not we. People may like this message or they may dislike it, it changes only one thing. Where they chose to put themselves. Within God’s kingdom, or outside of it. To be God’s children and heirs, or rebels and revolutions against true Lord. Christ reign has begun, nothing is going to change it. Nothing. All authority is given to Him. We cannot even understand what these words mean. They are too big for us. But one is clear – we are either with Him, or against Him. There is no third, neutral way. There is no Christianity, then other religions and then some neutral secular spot. No! There is either true God, or rebellion against Him. That simple. The last thing to discuss is our motivation. What should it be? We read that Jesus disciples returned rejoicing. Of course. Just remember what had happened. They healed the sick, they cast out demons in Jesus name. That’s so exciting. To be able to do all these things. You can feel almost like the Son of God Himself. We would probably rejoice if we had similar abilities; to do miracles which everyone can see. It would make us so special. Us so special… Right? We always rejoice when we accomplish things, when we can see results. Sometimes there are results to what we do, sometimes there are not. When we talk about sharing Gospel, our joy, our motivation shouldn’t depend on our achievements. Jesus said: “Do not rejoice in this, that the spirits are subject to you, but rejoice that your names are written in heaven.” What is this strange saying? Your names are written in heaven. At Jesus time there where books in most of the cities where the names of the citizens where written. Not everyone’s name was in this book, only names of those who were considered important [!] people. If your name was in this book you could enjoy all the benefits that citizens on the city were entitled to receive. This is what is means for us, as Jesus beloved disciple John revealed it. He saw “a new heaven and a new earth… And heard a loud voice … “Behold, the dwelling place of God is with man… He will wipe away every tear from their eyes, and death shall be no more, neither shall there be mourning, nor crying, nor pain anymore.” (Rev 21:1-4) This is about our future. About the return on our King. But what is the most important … “only those who are written in the Lamb’s book of life” (Rev 21:27) will enter this city. 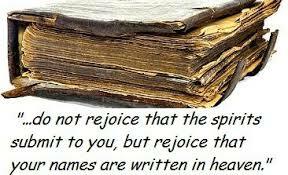 Rejoice for your names are written in heaven! Yes, yours! This has to be our true motivation. That our names are written in heaven. Jesus didn’t say that your names will be written in heaven. No! They are already written in heaven. We may wonder – how did this happen? When did my name where written in heaven? When you were adopted as a child of God in the Holy Baptism. Then each you were made a citizen of God’s kingdom. Then we were made heirs of God’s kingdom. Important citizens, by the way, who enjoy all the benefits. We ought to do our best bringing the message of shalom and God’s kingdom, which is entrusted to each of us. We need to strive to do it as well as we can to the people among which we live, for we are speaking not in our own authority, but on behalf of Christ. But our motivation doesn’t come, it shouldn’t come from the results of our mission. Then we would depend on our own success. When words of God are spoken, they will do their job. The result is not up to us. No, the source of our motivation and joy is the fact, that God the Father because of Jesus has already accepted us. That He has already written our names in heaven. We know what awaits us. We don’t know how exactly it will be, but we know that is will be joyful peace, it will be shalom in the presence of God.